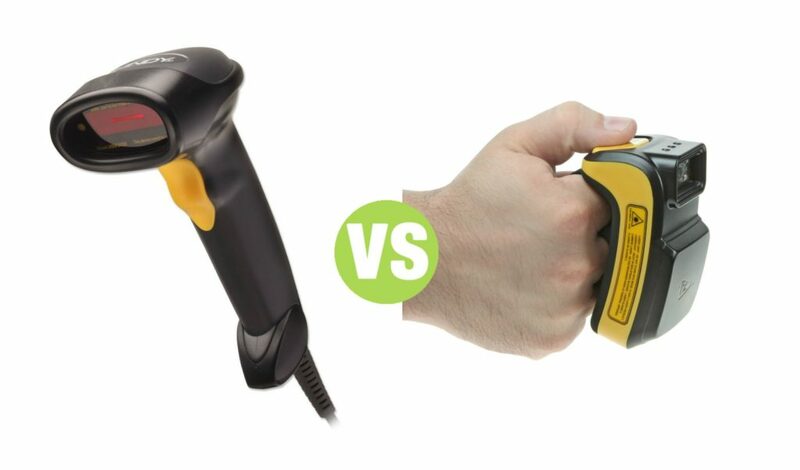 Summary: Difference Between Barcode Reader and RFID Reader is that bar code reader, also called a bar code scanner, is an optical reader that uses laser beams to read bar codes. While RFID (radio frequency identification) is a technology that uses radio signals to communicate with a tag placed in or attached to an object, an animal, or a person. RFID (radio frequency identification) is a technology that uses radio signals to communicate with a tag placed in or attached to an object, an animal, or a person. RFID tags, which contain a memory chip and an antenna, are available in many shapes and sizes. An RFID reader reads information on the tag via radio waves. RFID readers can be handheld devices or mounted in a stationary object such as a doorway. Many retailers see RFID as an alternative to bar code identification because it does not require direct contact or line-of-site transmission. Each product in a store would contain a tag that iden tifies the product. As consumers remove products from the store shelves and walk through a checkout area, an RFID reader reads the tag(s) and communicates with a computer that calculates the amount due. Other uses of RFID include tracking times of runners in a marathon; tracking location of soldiers, employee wardrobes, airline baggage, and misplaced or stolen goods; checking lift tickets of skiers; managing inventory; gauging temperature and pressure of tires on a vehicle; checking out library books; and tracking payment as vehicles pass through booths on tollway systems.